Carbon monoxide is an odorless, colorless gas that's created whenever any kind of fuel is burned. Even humans and animals, when metabolizing food, produce small quantities of the gas, but carbon monoxide – chemical formula CO – is also deadly enough to kill a person in a matter of minutes through carbon monoxide poisoning. The problem occurs when carbon monoxide is created in any sizable amount by burning fuels like wood, paper, oil, gas, kerosene, or any other carbon-based source of combustion. Cigarettes and cigars are a notable source of CO, as are charcoal barbeques, car exhaust, kerosene and oil heaters, forest fires, and many industrial processes. 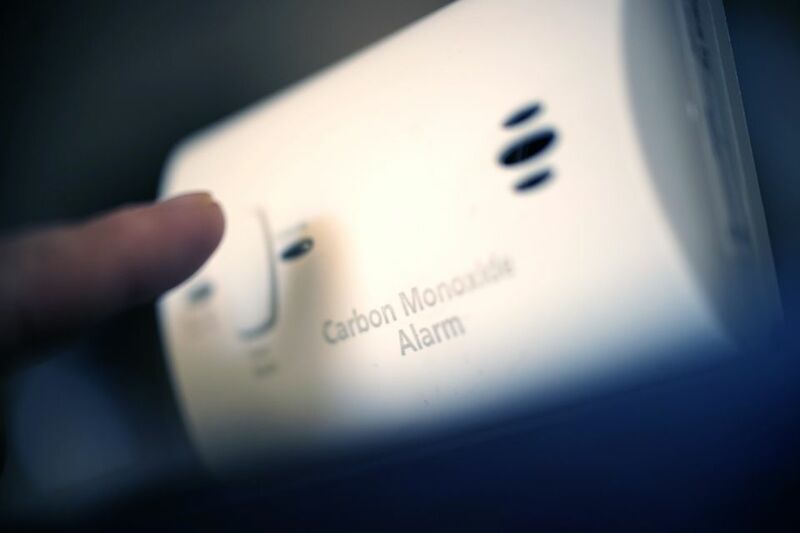 Carbon monoxide poisoning kills hundreds of people each year. Learn to protect yourself and your family from CO poisoning by following a few smart tips, courtesy of the EPA. Many household appliances produce carbon monoxide. If appliances that burn fuel are maintained and used properly, the amount of CO produced is usually not hazardous. If appliances are not working properly or are used incorrectly, however, dangerous levels of CO can result. Hundreds of people die accidentally every year from CO poisoning caused by malfunctioning or improperly used fuel-burning appliances. Even more die from CO produced by idling cars. Fetuses, infants, elderly people, and people with anemia or with a history of heart or respiratory disease can be especially susceptible. Have your fuel-burning appliances – including oil and gas furnaces, gas water heaters, gas ranges and ovens, gas dryers, gas or kerosene space heaters, fireplaces, and wood stoves – inspected by a trained professional at the beginning of every heating season. Make certain that the flues and chimneys are connected, in good condition, and not blocked. Choose appliances that vent their fumes to the outside whenever possible, have them properly installed, and maintain them according to their manufacturers' instructions. Read and follow all of the instructions that accompany any fuel-burning device. If you cannot avoid using an unvented gas or kerosene space heater, carefully follow the cautions that come with the device. Use the proper fuel and keep doors to the rest of the house open. Crack a window to ensure enough air for ventilation and proper fuel-burning. Don't idle the car in a garage, even if the garage door to the outside is open. Fumes can build up very quickly in the garage and living area of your home. Use common sense: Don't use a gas oven to heat your home, even for a short time. Don't ever use a charcoal grill indoors, even in a fireplace. Don't sleep in any room with an unvented gas or kerosene space heater. Don't use any gasoline-powered engines (mowers, weed trimmers, snow blowers, chain saws, small engines or generators) in enclosed spaces. Perhaps most importantly, don't ignore symptoms, particularly if more than one person in your household is feeling them. You could lose consciousness and die if you do nothing. It's important to know the symptoms of carbon monoxide poisoning. At moderate levels, you or your family can get severe headaches, become dizzy, mentally confused, nauseated, or faint. You can even die if these levels persist for a long time. Low levels can cause shortness of breath, mild nausea and mild headaches, and may have longer-term effects on your health. Since many of these symptoms are similar to those of the flu, food poisoning or other illnesses, you may not think that CO poisoning could be the cause. If you experience symptoms that you think could be from CO poisoning, get fresh air immediately. Open doors and windows, turn off combustion appliances and leave the house. Is anyone else in your household complaining of similar symptoms? Did everyone’s symptoms appear about the same time? Carbon monoxide detectors are widely available in stores and you may want to consider buying one as a back-up, but not as a replacement for proper use and maintenance of your fuel-burning appliances. It is important for you to know that the technology of CO detectors is still developing, that there are several types on the market, and that they are not generally considered to be as reliable as the smoke detectors found in homes today. Some CO detectors have been laboratory-tested, and their performance varied. Some performed well, others failed to alarm even at very high CO levels, and still, others alarmed even at very low levels that don’t pose any immediate health risk. And unlike a smoke detector, where you can easily confirm the cause of the alarm, CO is invisible and odorless, so it’s harder to tell if an alarm is false or a real emergency. Don’t let buying a CO detector lull you into a false sense of security. Preventing CO from becoming a problem in your home is better than relying on an alarm. If you shop for a CO detector, do some research on features and don’t select solely on the basis of cost. Non-governmental organizations such as Consumer Reports, the American Gas Association, and Underwriters Laboratories (UL) can help you make an informed decision. Look for UL certification on any detector you purchase.